Cup or glass of water on a flight. Travel by plane, table with drink. The one thing people always tell you to do before you fly is to hydrate. Hydrate at home, hydrate in the airport, and hydrate on the plane. 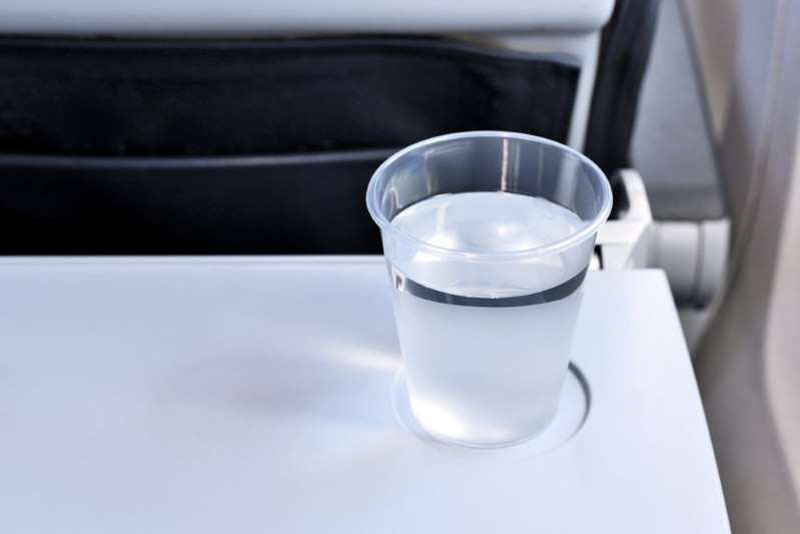 Well, you might want to stock up on water while you’re still on the ground because a new study revealed that the tap water on planes isn’t very sanitary. Watch out for these foods you should never eat on an airplane. Back in 2011, the EPA instituted the Aircraft Drinking Water Rule (ADWR) to 'ensure that safe and reliable drinking water is provided to aircraft passengers and crew,' but that rule doesn’t go far enough. The tap water served to customers and used to make coffee in tea is stored in water tanks that are not cleaned very often causing the water to be contaminated with bacteria. Read up on the airlines with the best and worst food. So, make sure you stock up on bottled water (and coffee or tea) while you’re still in the airport—it could save you from a ruined vacation. Next, read about these 18 other things you should never do on an airplane.